Jefferson County Pet Food Pantry : No Thrift Store Donations Until Jan. 2017. 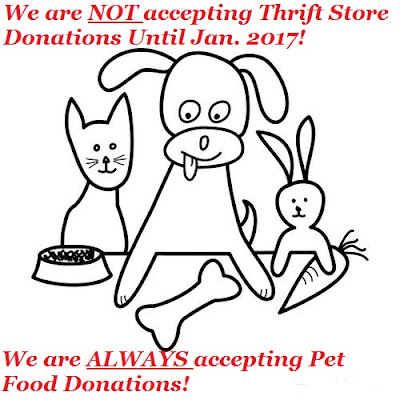 No Thrift Store Donations Until Jan. 2017. We really appreciate the thrift store donations we receive from the public. Right now we are packed beyond capacity. We need to concentrate on getting our pantry members taken care of and our volunteers could really use a break over the Holidays. 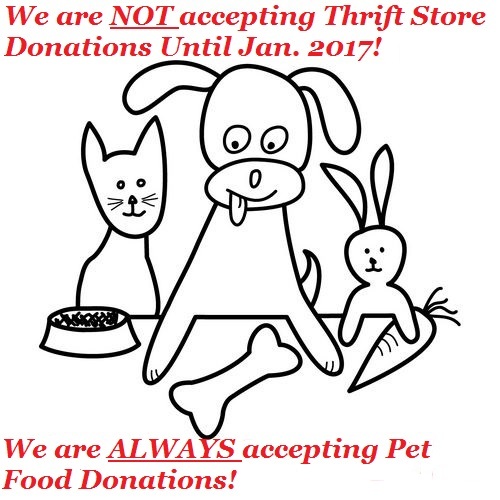 We will NOT be accepting Thrift Store donations until Jan. We will ALWAYS accept pet food and pet related donation. PLEASE NO MORE Christmas decorations. Thanks so much for your support and understanding.